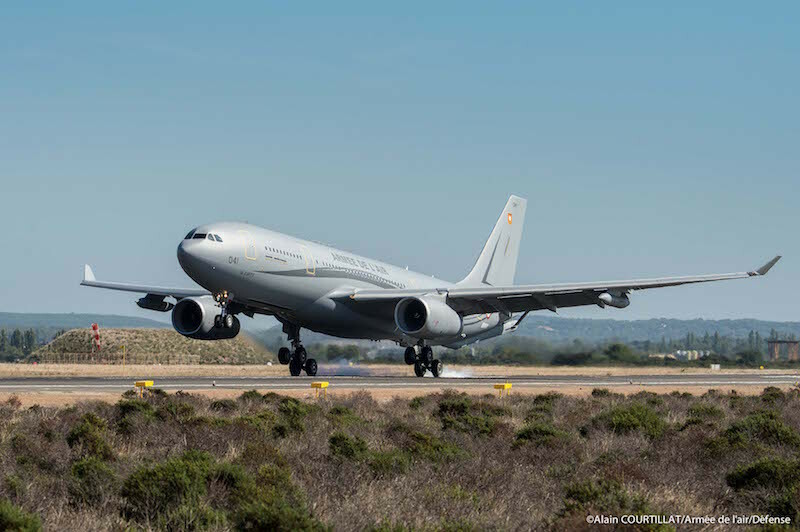 The first Airbus A330 Phénix Multi-Role Tanker Transport Aircraft (MRTT) arrived Thursday afternoon (on September 27) at Istres air base, in south-eastern France. Its reception operations, managed by the Directorate General of Armaments (DGA), will be completed, allowing its hand-over to the Air Force. Armed Forces Minister Florence Parly will travel to Istres on October 19 for the official ceremony marking the arrival of the first Phoenix MRTT in the Air Force, together with General Lavigne, Chief of Staff of the French Air Force. By its versatility, the A330 Phénix will replace two types of aircraft in the air force’s fleet: the C135 and KC135 tanker aircraft, some of which will be nearly 60 years old by the time they are retired, and the A310 and A340 strategic transport aircraft, used for both personnel and freight. Twelve Phénix aircraft will be delivered to the Air Force by 2023, out of a planned total of 15, as specified by the 2019-2025 Military Programming Law, and the minister’s wish to accelerate their delivery. Its missions will include supporting the air component of the nuclear deterrent, the contribution to France’s permanent security posture, the projection of forces and power as well as the medical evacuation in case of emergencies or natural catastrophes. The MRTT Phoenix is based on an Airbus A330 commercial aircraft, modified to meet specific military requirements, principally mid-air refueling. This type of aircraft is already in service with several of our allies. This first MRTT Phénix aircraft is due to enter operational service with the strategic air force command in 2019, after a technical and operational evaluation campaign carried out by the Air Force and intended to develop the procedures for use its operational employment, doctrine and procedures. In addition, on September 27th, the second MRTT Phénix aircraft, scheduled to be delivered in 2019, made its first test flight out of the Airbus plant in Getafe (Spain), following its conversion into a military plane.